Incepted in the year 2015, "Greentech Engineering", is one of the foremost Manufacturer, Exporter and Trader firms of next generation Industrial Machine and Dies. Our state of art production center furnishes us to provide a comprehensive variety of highly demanded machinery, such as Fully Automatic Dona Making Machines, Hydraulic Plate Machines and Disposable Dies. Produced by an ambition to offer high value and cost saving mechanism, our offered machinery are well chosen for being high accomplishing, energy saver, user-friendly and maintenance free. It is a great opportunity for us to earn the market requirements of multiple small and mid-sized organizations. We export to Shri Lanka, UAE, South Africa. Furthermore, our offered fully automated machinery is specifically designed for SME empowerment, as it can be introduced at indigenous production centers to support the high performing output. With continually enlarging our expertise we have produced this price efficient machinery that works without the annoyances of operation training and maintenance. The driving force after our sustainable growth is our customer-centric strategy, which encourages us to optimize our production system as per the customer specification. Owing to the world-class production division we are effective in producing machines that gain us a coveted listing of satisfied clients and a sustained growth of our valuable patronage. The environmental interests of our leader and mentor "Mr. Hiren Radadiya", happened in an Eco-friendly range of machinery. His specialization in this product line drives us to sustain the year-round by creating highly productive machinery rendering excellent output. Manufacturing and Trading of Dona Making Machine etc. We have a profoundly experienced team of production experts and diligent workforce, who are liable to offer Industrial Machine and Dies. Furthermore, the collegial work atmosphere we promote is owing to the collaborative efforts of our price analysis and quality control supervisors accompanying with sales and marketing professionals. Our team members strive to correlate with the evolving market inclinations to administer continuous updates about innovative technology and leading mechanism. Our production actions are encouraged by the strong ethos of allegiance and quality policies. We have a rigorous set of rules outlined to perform our day to day business operations obedient to the highest quality standards. 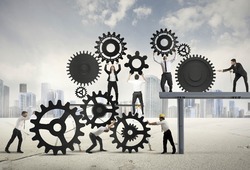 Our networking with distinguished vendors guarantees that we obtain most reputable components for our machinery. Furthermore, we examine the sourced raw material and later verify the complete machinery to verify a defect-free machine is being transmitted to our distinguishable clients. 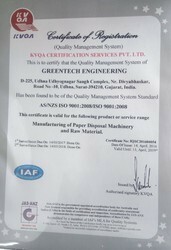 Our company Greentech Engineering is certified to the quality management system standard of AS/NZS ISO 9001:2008/ISO 9001:2008. Our infrastructure is strategically outlined and updated to harmonize the technological improvements in the realm of paper cup making machinery. The production unit is well furnished with high-end advanced machinery to produce reliable elements and machine parts. Moreover, our thoroughly outfitted testing and packaging assemblies are where we prudently utilize our technological expertise to earn the evolving requirements of our prestigious customers. We have been assisting the industry since our initiation, which absolutely has served our professionals to optimize their potentials, and making them extremely experienced. Our effort to sustain amiable relationships with our prestigious clients shows in the circumstance that all our devices are formed by maintaining user-friendliness at the focal position. Furthermore, our approach towards competing for cost guarantees us successful stature in the business.